Our 10,000 Island public tours offer the opportunity to see a variety of marine life including dolphin, manatee, sea rays, sea turtles and sea birds. Our 10,000 Island private tours (no more than six passengers) offer the opportunity to go into areas the public tours can not, and see a variety of marine life. 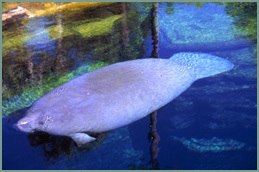 With less than 3,300 manatee believed to inhabit Florida, the 10,000 Islands offers home and refuge to many of these wonderful creatures. ½ price on selected tours. 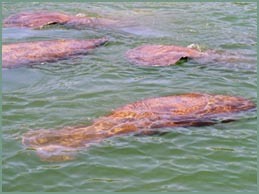 Our 1 1/2 hour ‘Manatee Adventure’ guarantees that you will see manatees. This exciting private eco-tour takes you into a remote everglade manatee hangout. No more than six passengers. If you don’t see manatee, you don’t pay! (discounts given for additional adults in same party). Children under age 6, $15. Price: Four-Hour Tour: Approximately $420.00.